The Gunpowder River spiked at the Falls Road Bridge to 40 CFs after the heavy rains caused some spillover at the dam. The increase is also due to blow outs in the smaller tributaries above the Falls Road bridge. Aside from the initial rise in levels after the storms, the upper miles of the Gunpowder remained clear. 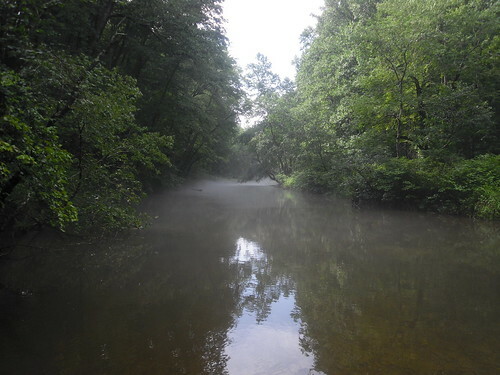 The tributaries that blow out farther downriver are still dropping, so anglers can find slightly higher flows in the sections below major tributaries. The shop was notified that there will be an increase in flow from Prettyboy Dam in time for the weekend. The volume will increase from the mid 30 Cfs range, and level out between 75-100 CFs. Yesterday I took advantage of the higher, slightly off color flows below a blown out tributary. 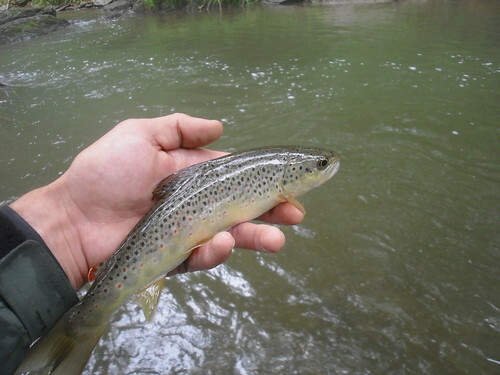 The nymph fishing was phenomenal in the riffles and deeper pools. Visibility was greatly reduced, but still clear enough to see the bottom in two feet of water. These types of conditions can be “feast or famine,” where anglers catch nothing, or catch a lot of trout. The combination of higher flows, a four to five degree spike in water temp, and the murky water tipped the odds in my favor. I started at 1 pm with an inchworm and a size 22 trico spinner drowned under an indicator. Six fish into the day, and four on the trico pattern, I switched out the inchworm for a rock worm caddis pattern. I switched flies occasionally throughout the day, working some areas twice with different patterns. By the end of the day an inch worm, SJW, caddis pupa, rubber legged nymphs, and midges all caught trout. My two biggest measured twelve inches, but it was a steady action day with a lot of trout between seven and eleven inches. I also caught four rainbows between ten to twelve inches in this section, the first rainbows I have ever caught in this area. Now that the majority of the storms have passed and a release is planned, conditions are looking ideal for the weekend. If a storm does roll through and raise tributary levels, the fishing will be good, but mainly upstream of Blue Mount Road through Falls Rd. Little Falls is currently still very muddy and sections down by Monkton were chocolate milk this morning. On rainy days this week blue wing olives were out whenever the sun was trapped behind cloud cover. The mid morning Trico hatch is great for a few hours of rising trout, while the midday and afternoons are terrestrial time. The increase in flow should also get the fish active for a few days on nymphs dislodged by the higher water. The lower flows from the past week were great for sight fishing. In the latest video post I included some scenery, some browns in plain sight, and a few fish from my day yesterday. This entry was posted in fishing report, video on July 15, 2010 by Jason du Pont.